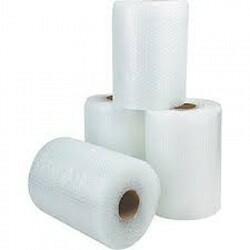 We are offering a wide range of Air Bubble Film Roll. - Offers perfect protection for all fragile items glassware, vases, antiques, and all other valuables/collectibles. - Non-Abrasive, won't scratch or mar delicate surfaces. - Superior puncture resistance, gives product superior protection. - Superior burst strength, bubble withstands pressure and abuse. We bring forth vast industrial experience and expertise in this business, involved in offering a high-quality range of Air Bubble Sheet.